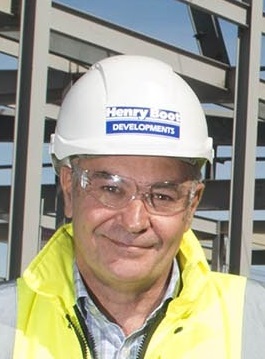 To mark the opening of The Event Complex Aberdeen (TECA) in the summer, Nigel Munro, the regional project manager for Henry Boot, describes his work on the project. At over £300 million in value, 418 metres long, 30 metres high and using 8,300 tonnes of steel, TECA is the single biggest development project I have ever been involved in. This project, which will open this summer to replace the existing AECC, will be transformational for Aberdeen and the North East. TECA will attract significantly more events, performers and conferences to the area, so in turn more visitors. Knowing the impact this project will have on the area’s economy has made it particularly rewarding to work on. I have many years’ experience in property project management, and some schemes have been even more complex than TECA, but the tight timescales and level of stakeholder engagement make this the biggest challenge for me to date. As the development partner for this project, Henry Boot Developments works closely with a vast range of companies to deliver the scheme from start to finish. My role is often compared to the conductor of an orchestra – doing what is required to allow the team to perform to its very best. In order to deliver TECA, I work closely with a team from main contractor Robertson Construction and Turner & Townsend Project Management, on behalf of our client and development partner, Aberdeen City Council. I split my time between the TECA site and our regional office in Glasgow, which is close to many of the key design team members. Days on site can be tiring, but ultimately rewarding. My focus is on progress, design and cost issues, liaising with the Council and the facility’s operator, SMG. On a project of this scale there is a considerable amount of day to day project management, but the key for me is to identify any issues as early as possible and work with the overall team to resolve them. The first days of any project are always exhilarating. At TECA we hit the ground running in July 2016 with demolition, earthworks and major service diversions starting immediately. We had been so immersed in bringing the project to site that it was only when work began that I realised the enthusiasm of the local community, which added to the excitement. There have been a few notable moments. When we started on site, diverting utilities were the key challenges. We had to relocate five streams that crossed the site into one new river around the perimeter - a complex piece of engineering. Scottish Environment Protection Agency (SEPA) took a close interest in this work and our team had to overcome numerous issues - however, we completed the work on programme and were pleased to hear that SEPA now use our project as an example to others. We also faced a demanding environment over that first winter, and keeping on programme was tough, but excellent technical work from the contractors and good partnership work with the utility companies triumphed. The design of the main building is largely metal cladding, so the insolvency of the main cladding subcontractor in early 2018 was a challenge. Short-term progress was affected, but the timely intervention of the Robertson team to take this work on allowed us to progress and recover lost time. The start and completion of the steelwork and the building becoming wind and watertight were also proud moments. Ultimately the most rewarding aspect for me has been the ability of the project team to work together to deal with any issues that have arisen, which now allows us to look ahead to the final few months of the project with enthusiasm and confidence. The interior design package is now underway, so spaces within the building are starting to come together. Between now and April, internal areas will be completed, and the energy centre will go live, providing heat, cooling and power. What has for a long time felt like a massive engineering project will then really become TECA - the finishing line is in sight. When the building opens in the summer, there will undoubtedly be a big-name performer lined up for the inaugural gig. Whoever it may be, watching this fantastic facility - which has been such a huge part of my life for the past few years - come to life will be a moment that stays with me for a very long time.